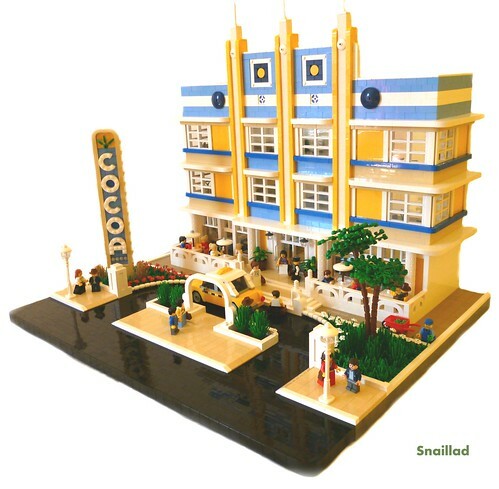 Hi everyone, here is my latest creation, the Cocoa hotel. I got my inspiration from old postcards showing hotels and other buildings in bright holiday settings. The postcards are perhaps a little unrealistic but definitely bold, fun and there's always a blue sky! I chose to base the build mostly on the Carlyle hotel which still exists to this day as I had the bricks to achieve it. It's not an exact copy, most reference material to the colour shows it's been changed several times, so I chose to go with beach colours which I had a decent amount of. I have made many changes to the design but wanted to keep the 3 vertical columns as a focal point. I wanted to do a little more landscaping and make the build with more depth as opposed to height like my previous building 'Avenue Saint-Jacques'. I liked the idea of having a drop-off driveway and a large veranda but this is not necessarily an accurate reflection of what you may see in reality. I never wanted to leave it empty so have furnished all 3 floors. Downstairs there is a lobby, lounge and bar. Upstairs has 4 suites with individual bathrooms. I have included some pictures of the exterior and interior, more at the link at the below. Just fantastic, as usual, and such a quick turn around from your last creation! The colours are so vibrant and inviting, like a warm day at the beach. It looks fairly small on the outside, but the interiors reveal that this is not the case, the detail inside is excellent. 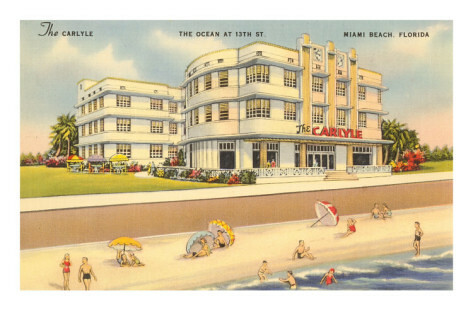 Just needs some neon lighting to go with the style synonymous with Miami's Art-deco hotels! The facade: even if this kind of architecture is note my taste (to each his taste), I find it really really nice and very well done! The "minute car stop" is sympathetic. I find black a bit to much "hard" and contrasting against this light colored facade. The interiors are... splendid! So much details, this luxury atmoshpere ... But where are the stairs or the lift???????? 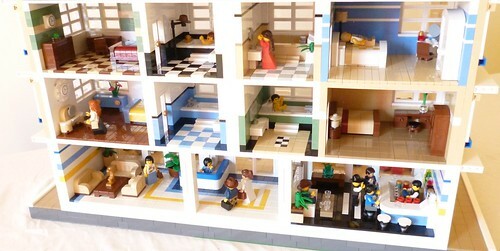 You've made there another really really great MOC (I also really enjoyed your lastest one, St Jacques)!!! Congrats! I spotted this on Flickr a couple of hours ago, but it's to good not to comment on again: I love it! The general architecture, the colours, the clean style, the curves, the sign, the sideways-mounted windows - and that's just the outside of it. The inside is just as great - especially the ground floor with the bar and the reception desk. Again: The curvature is fantastic and so right for that era. Gorgeous! That might be the best thing I've seen since I joined this website. And I'm really impressed that you furnished it ALL! I'm curious, how many parts did you use in total? Wow this is so amazing and beautiful. I like everything about it. Especially how you designed every room differently, even with different wall colors. Stunning. My minifigs told me, they want to spent their vacation in the Cocoa. Incredible! This is just beautiful. The exterior is very nice, and be interior is just great! So many details. 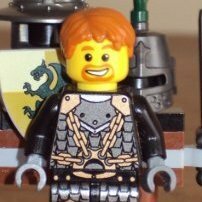 amazing attention to detail! As a whole it is phenomenal but i particularly like the driveway and the sign. Amazing work! But the whole thing really is superb!! 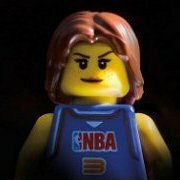 Those lucky minifigs!!! I love this . I wanna go there on holiday! But where's the beach and pool?! It looks so clean - fantastic job! Well done putting those colours together, too. 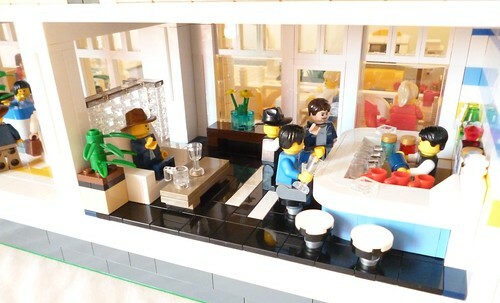 Another brilliant creation Snaillad and there's so much to enjoy in this MOC. I particularly like the Bar area, the big vertical sign and the color palate you've chosen. It just looks perfect! It's fantastic! I'm looking for a place to go to on summer holidays, and I wouldn't mind booking a room at your Cocoa hotel! There's so many fantastic details. All the snot builds are great, and adding many rounded structures give a special 'personality' to the hotel. My favourite are the details on the fence at the front, the rounded driveway with flowerbeds, the hotel sign and rounded shelves on the building. Also the colour scheme is nice in combination with geometrical shapes (squares, stripes and circles). The interiors is equally impressive, and again the geometrical style is nicely continued from the exterior. The glass wall near the bar is great, and the rooms are very stylish and spacious. I like the slightly different bathroom styles. Very good, I have stayed in some of those old colonial style hotels on my travels. Simply stunning in every way. Love all the curves from that era and you've recreated it perfectly well done. That is a really stunning creation. Just magnificent. I really love the way you just have worked it all way through, and all the colors that compliment each other so well. Congrats on being front paged with this totally AWESOME and beautiful art-deco style building....the period detailing and scenery is perfect ! Wow! I love it! Beautiful interior, great creation! Keep up the good work with all of the details! 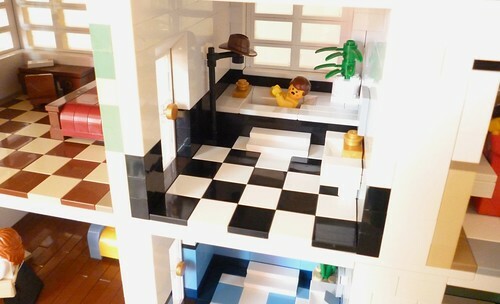 A wonderful hotel where all minifigures can relax. Also very nice deisgn which also blended well with the taxi. I love the colors and the fence out front. The spaciousness of the rooms and bathroom is great. I really like how sophisticated it looks in dollhouse style! Even the base is gorgeous! Very majestic! Love the combination of colours and lighting. Made me feel at home! Congratulations in making it to the Frontpage!